The past month has witnessed a steady stream of developments supporting the likelihood of higher interest rates. Economic data has improved, tax cuts appear to be moving through Congress and investors are, for the first time in over a decade, contemplating a more hawkish Federal Reserve (Fed). All of which have led to a predictable backup in long-term rates. As rates have risen, investors have, once again, started asking the perennial question: Is the bond bull market over and are rates normalizing? My view: It’s complicated. In thinking about bond yields, it is important to keep longer-term factors in mind that have nothing to do with central bank policy. 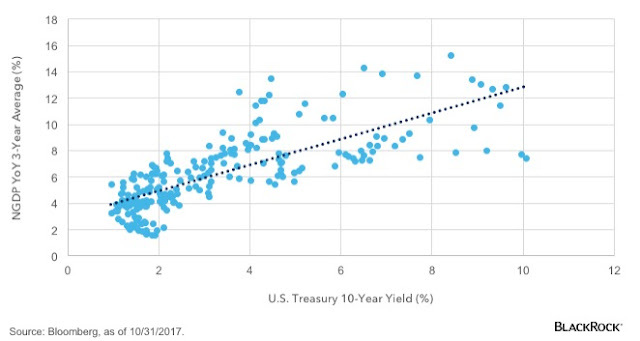 Low yields have correlated with two, related longer-term trends: low nominal GDP (NGDP) and an aging population. The reason they’re related is that an aging population means slower growth in the workforce, and in turn, slower economic growth. An aging population impacts rates through a second mechanism. As consumers age, their borrowing and investing patterns shift. Older households tend to borrow less and demonstrate a preference for income, in the process raising the demand and lowering the supply of bonds. The net result is that older populations tend to be associated with lower real, or inflation-adjusted interest rates. This dynamic has been at work for decades and helps explain why low yields predated the financial crisis. What would need to change? For nominal growth to improve, either real growth needs to accelerate beyond the 2% to 2.50% range that has characterized the recovery, or inflation needs to materially increase. As of now, there is little evidence of either. To be sure, the economy will grow a bit faster this year, and a tax cut next year would help further. However, neither the current acceleration in growth nor the prospect of a limited tax cut points to a return to sustained +3% growth. As for inflation, it is conspicuous by its absence. The Fed’s preferred measure of inflation is stuck at 1.30%. None of this suggests that rates are not heading higher. Given Fed tightening and marginally faster growth, they probably are. However, higher does not equal normal. What does normal look like? The average 10-year Treasury yield in the 20 years prior to the financial crisis is around 6%. The bond bull market may have ended, i.e. rates have probably bottomed, but normal is a long ways away. Courtesy of Russ Koesterich, CFA, Portfolio Manager for BlackRock’s Global Allocation team and is a regular contributor to The BlackRock Blog.